I started my hydrangea Temple chasing a little earlier this year. Last year I waited until the end of June to visit Meigetsu-in Temple. This year, I wanted to visit a little earlier. Last night, several of my neighbors were discussing going to the Meigetsu-in Temple this morning to see the blue hydrangea. They have young children and were able to arrange child care specifically to visit the Temple today. I was more than happy to tag along! Oh, and give them a small taste of a Julia Tour. We met at 9:00am and were at the Temple in Kita Kamakura by 9:45. It was already so crowded. My main photo objective was to photograph the steps leading up to the gate. I anticipated a crowd. But, nothing like this! We were able to walk slowly and the crowd thinned a little bit. This is the picture I wanted because it matches the wall hanging I recently purchased. I used the Retouch App to cut out the people. What do you think? If you have amazing skills with using photoshop or another photo editing app and want to try editing them out, let me know. I’ll send you the original. I ordered an 8×10 photo of my edited version this afternoon. We will see how it looks when it arrives. Here are a few other pictures from out and around the Temple. The blue hydrangeas are so beautiful. I remembered from last year how cute the Buddhas were decorated. The zen rock garden was so serene. It was fun to visit the Temple together. There has been a big turnover of people in our neighborhood in the past 6 months. These ladies all live at the top of the hill close to us. Here’s our hydrangea selfie! I think there is a good chance I will go back this week in the early morning to try and get the stair picture without people. I talked with my Japanese sensei at English class this afternoon and she recommended I arrive at 7:30am. Good thing I’m an early bird! I feel like I need to seize every flower chasing opportunity because I have a sneaky suspicion we will transfer before this time next year. More on that when things solidify a bit more. In the meantime, I’ll obsessively chase flowers! Saturday morning, Atsuko and Manami taught me how to cover a Japanese tea box. This is the third tea box I have covered and by far the largest. Atsuko helped me select the fabric for the tea box. We picked out a fabric with many Japanese symbols. If you look closely, there are two different images of Mt. Fuji. We had fun working together, talking and laughing. Like I said, the tea box is very large. I’m standing on my tippy toes to see over it! I have one more tea box that we will cover in a couple of weeks. Atsuko and Manami are so kind to help me to create these beautiful additions to our home decor. The tea boxes are very practical storage solutions and unique keepsakes from Japan. The best news of today, I had my last Tuesday night English class. It feels like summer break! Although, I will continue to see my grandmothers on Fridays. None the less, I traded in my teacher cardie for a swimsuit and flip flops! The funny story of today was attempting to buy the supplies to make another tea box. Dina and I were instructed by Atsuko to go to the fabric store in Yokosuka vice Kamakura. So, we did. We both purchased fabric and batting. I also purchased enough batting to make a quilt or two in the near future. The fabric purchase was pretty easy compared to purchasing the foam to cover the top. Dina and I went to Homes to purchase the foam padding. 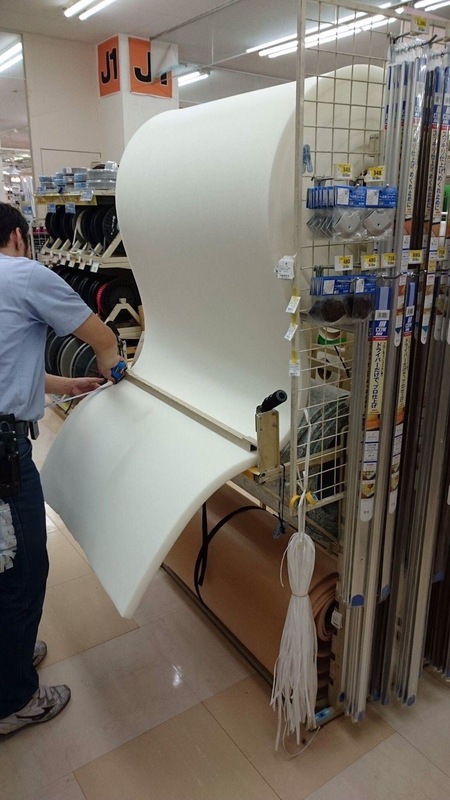 We walked around searching for a 50cm piece of foam padding without success. Dina was bold and asked for assistance. She even showed a picture to the store clerk. There was a customer standing nearby who overheard and asked us in English if she could help. She communicated with the store clerk and referred to foam as “fōmu” (pronounced fo-moo). Seriously!?! Anyways, they eventually took us back to a piece of furniture foam that was a 40cm square. Nope, not it. Dina and I eventually gave up and left. Meanwhile, during this ordeal, Dina messaged Atsuko and informed her we couldn’t find the foam. Atsuko said she would call the store. And she did. After Dina dropped me off for my Tuesday class, she realized she missed a call from Atsuko. The message Atsuko left informed Dina she called Homes and spoke with Mrs. Kobayashi. Atsuko told Dina to ask for Mrs. Kobayashi for assistance. Dina returned to the store and went to the customer service desk. She asked for Mrs. Kobayashi. Eventually, she was led back to the foam by a worker. One worker turned into six. All to cut foam. The same foam they couldn’t find an hour earlier. At some point, Dina heard them mention Atsuko. She said, “hai, Atsuko.” At which point everyone seemed to be even more impressed and attentive to Dina’s needs. Even funnier, Dina doesn’t think she ever actually met Mrs Kobayashi. What an adventure. 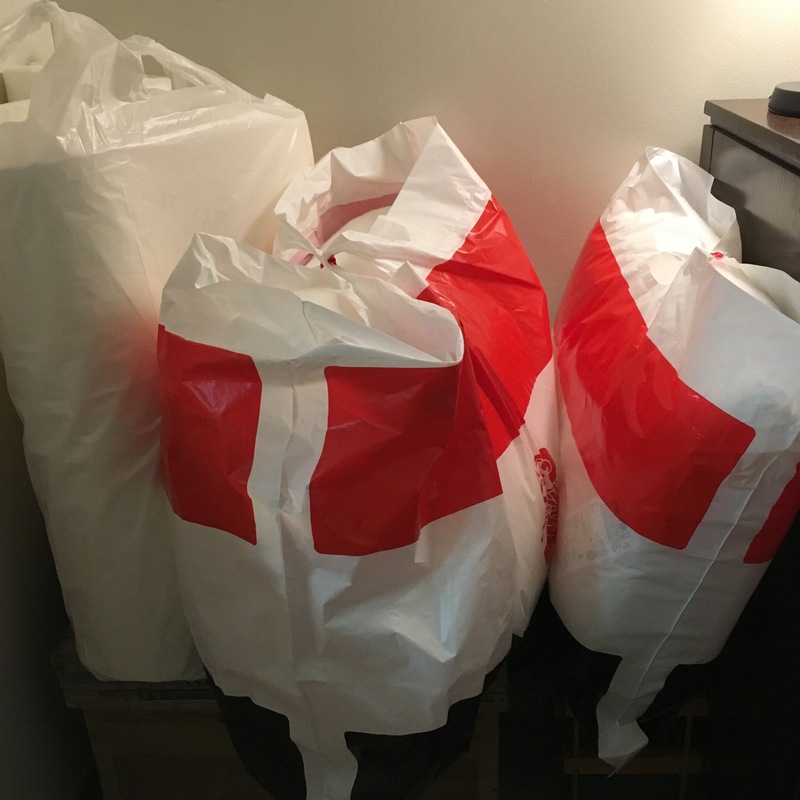 All for three bags of fabric, batting, and foam. I still need to get a tea box before next Wednesday. Dina’s tea box is under the bags. Here’s hoping the tea box purchase is a bit smoother. My Japanese student, Manami, and I meet once a week in order for me to help her with her English conversation and pronunciation. I find the time we spend together very enjoyable. Manami tells me each time how much it helps her to hear English from a native English speaker. We met this morning and she arrived with a very special surprise. Her mother, Atsuko, who helped me make the Japanese tea box, made Washi Eggs with Dina and her daughters last Friday. Atsuko sent Dina and email inviting me to come along. Here is the sweet quote from Atsuko that Dina sent to me. Unfortunately, they were meeting during my Friday afternoon English class so, I wasn’t able to tag along. Fortunately, for me, Atsuko is very kind and super sweet. Atsuko made me six Washi Eggs and had Manami bring them to our session today. Atsuko is very thoughtful and they are beautiful. 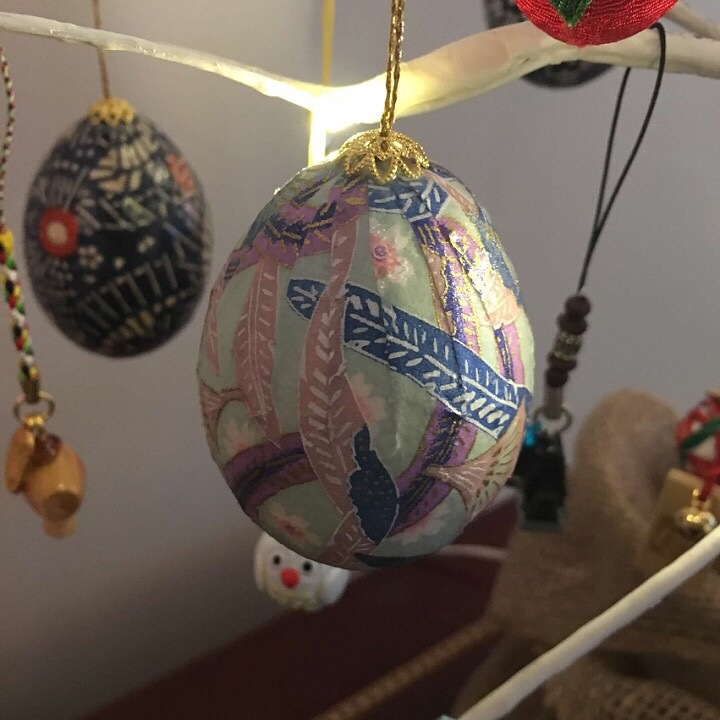 In case you are unfamiliar with Washi Eggs, they are made by blowing out the yolk of an egg and then covering the hollow egg with washi paper. Washi paper is a thin Japanese paper used when making origami. The washi paper is glued to the egg and then a varnish is applied to seal the paper and create a shiny finish. 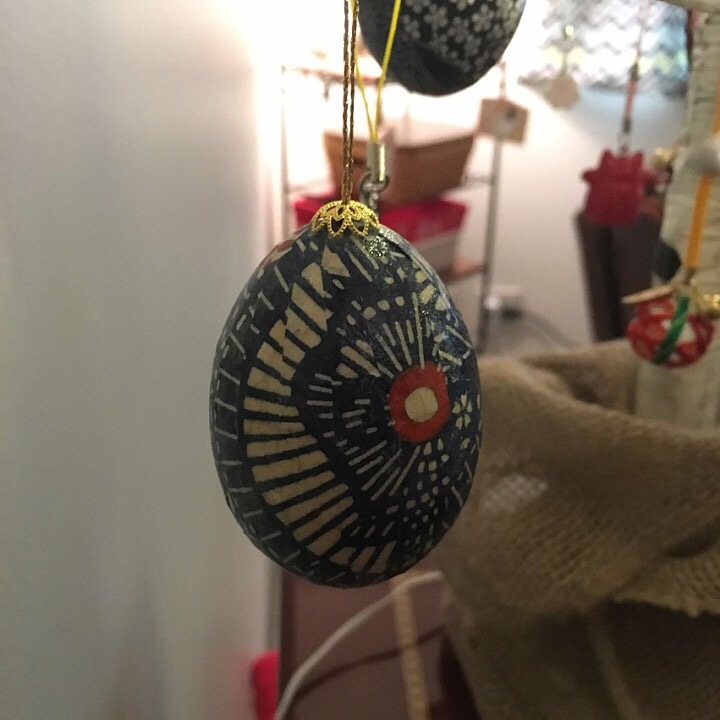 The final step involves adding a small hook in order to hang the decorated egg. One more thing to tell you. 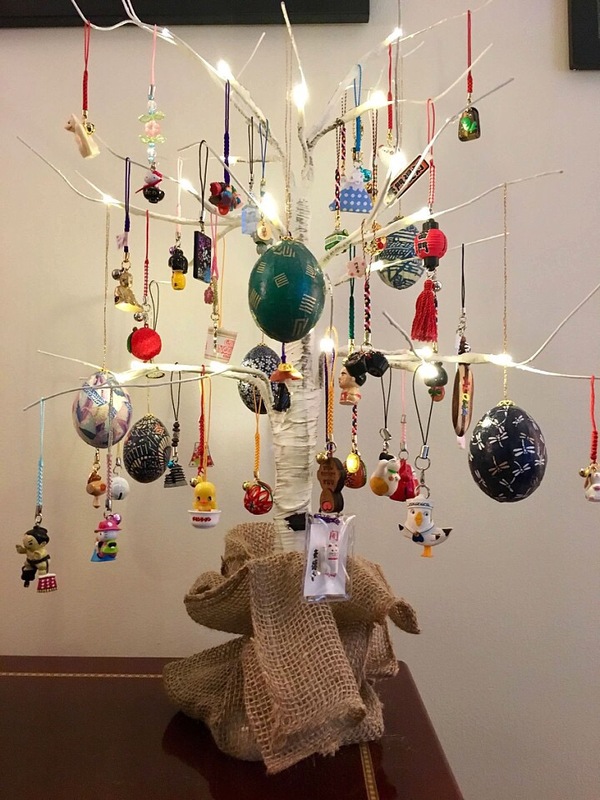 I loved my Japanese Christmas Tree with the small cell phone charms so much that I ordered a table top birch tree so I could continue to appreciate my charms throughout the year. Since it is no longer Christmas, I renamed my tree. 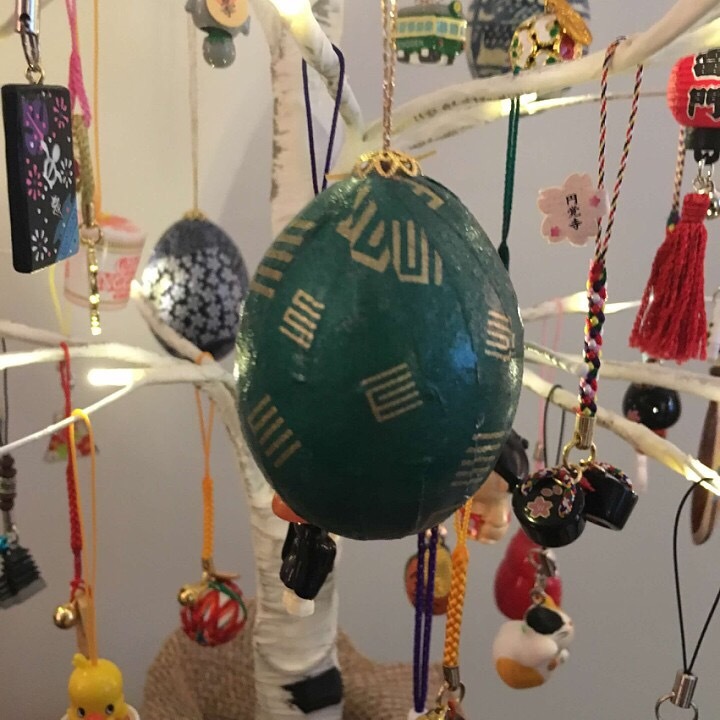 It is now known as the “Japanese Tree of Happiness.” Here is a picture of my “Japanese Tree of Happiness” with my six Washi Eggs! At first, the differences in the size of the egg and cell phone charms bothered me. Then I realized, the “Japanese Tree of Happiness” portrays wabi-sabi. Finding beauty and happiness with imperfection. 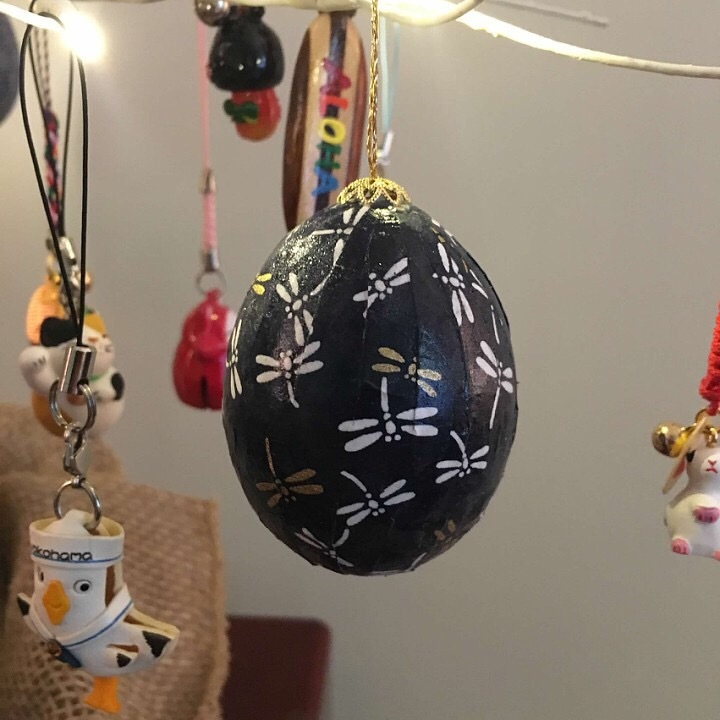 While Manami was here today, I showed her my “Japanese Tree of Happiness” and told her I was going to add the Washi Eggs. I sent her the picture and asked her to share it with her mom, Atsuko. Her mom was pleased to see I enjoy them and that they make me happy. I took close up pictures so you can see the detail and appreciate the beauty. Notice the paper was cut into strips and then glue precisely in place in order to align the patterns. I truly love and appreciate the gift I was given today. It was very special. 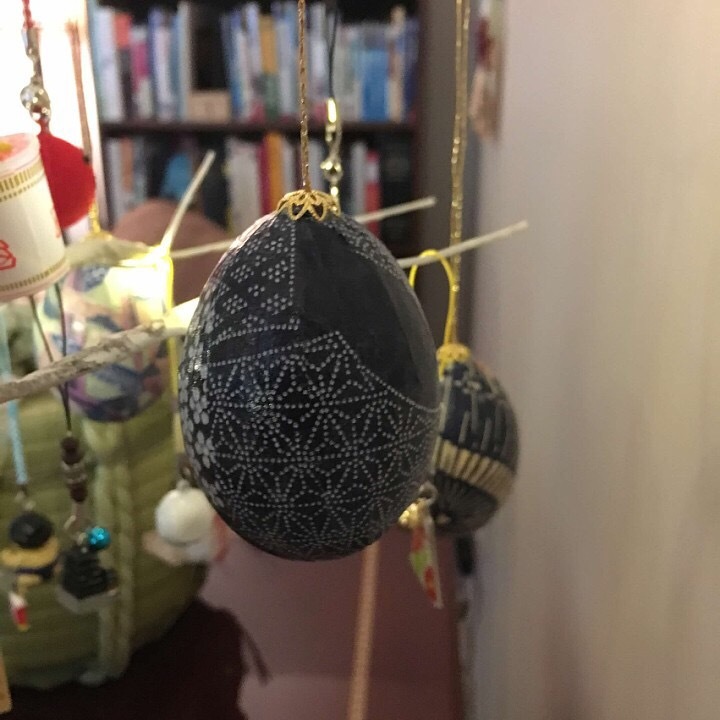 I am adding “make Washi Eggs” to my list of things to do while living here in Japan. In early December, Dina and I signed up for a class to make (cover) a Japanese Tea Box. I had to delay sharing this experience because the tea box was a Christmas present for my mom and I didn’t want to ruin the surprise. The class was taught by a sweet Japanese lady named Atsuko and was held here on the Ikego base. Dina and I went shopping for the materials together at the fabric store, Swany’s, in Kamakura. The box itself is provided as part of the class fee. The first step was to wrap the inside edges with a metallic tape to match the aluminum lining. In Japan, the tea box is part of the traditional tea ceremony. The tea box holds the items used throughout the tea ceremony. I thought the tea box would be a fun and unique gift for my mom for Christmas. Simultaneously, parents love getting homemade gifts, right? I picked out this fabric to cover the tea box. The next part involved wrapping the tea box with batting. I was actually able to use leftover quilt batting I had from making tshirt quilts. Yes, I moved batting scraps to Japan. In my defense, it was an excellent use of the scraps! First, the batting is wrapped around the box and then with a decent amount of tension, the fabric is wrapped around. The last part requires hand stitching of the corners. The final part to the bottom of the box is wrapping the upper edge with a contrasting fabric. A plastic band is stapled to the edge to help hold the fabric and keep it taut. The top is made in a similar manner. Atsuko helped me ensure the print of the fabric was centered. Besides having a cool Christmas present for my mom, another positive result occurred from meeting Atsuko. Earlier this week, I was contacted by Atsuko’s daughter asking if I would be willing to give her private English lessons. She recently took a new job with an International company and needed to brush up on her English. We agreed to meet once a week for our English conversation sessions. Our first meeting was last night, (Thursday) at my house. I met her at the train station on her way home from work. As in true Japanese style, she brought me a gift. Wrapped perfectly. And inside, little cheesecakes. Very delicious, but more like a moist coffee cake vice cheesecake. Our first session went very well. I helped her with comprehending a work related email and we talked about her New Year traditions. I’m excited to have an opportunity to learn more about the Japanese culture, make a local friend and build my travel fund.